First released in 1990 on legendary local label Imaginary, Turtle Soup, the debut album from Middleton’s Mock Turtles featuring early versions of their major label hits Can You Dig It? and And Then She Smiles, gets a welcome re-release on the ever popular Cherry Red label. Stuart Ralston falls in love with them all over again. Turtle Soup is such an extensive release that it feels more like a box set. Featuring a massive forty one tracks, this new edition sees all of the band's non-album singles, B sides, assorted cover versions and seven unreleased demos presented together as a must-have compilation. I first came across The Mock Turtles when the seminal poptastic Lay Me Down was released - the stand out track on Turtle Soup. A baggy, psychedelic, swirling masterpiece that still sound incredible over twenty-five years later. When released as a single, Martin Coogan was under pressure to quickly write a track suitable for the B-side. In twenty minutes he wrote the legendary anthem that would propel The Mock Turtles to stardom and Top of The Pops - Can You Dig It? More euphoric than Lay Me Down and opening with an instantly recognisable riff, Can You Dig It? captured the early 90s Zeitgeist perfectly. In the decades that followed, the re-recorded version that appeared on their next album, major label debut Two Sides, would become a staple of alternative radio stations and dance floors and infamously the Vodafone advert. The Mock Turtles never quite matched that success again but they did produce some beautiful pieces of pop, such as the third single from Turtle Soup, the majestic And Then She Smiles. Retaining the same charm as other Mock Turtles singles and demonstrating that Coogan was a master songwriter, And Then She Smiles later became the theme tune to Ruth Jones’ Stella TV comedy/drama. Yet, this compilation shows there were many sides to The Mock Turtles. Kathy Come Home and Oh Helen How? have more of a kitchen sink, Smiths tone whereas Another Jesus Walks On Water retains more of a power punk feel. The Willow Song changes the tone, style, pace and mood of the album completely. A breezy, acoustic ballad and beautifully orchestrated, The Willow Song is a huge departure from what their 90s contemporaries were producing. On songs like Mary’s Garden and How Does It Feel?, Coogan’s Bunnymenesque vocals dominate and on album closer Wicker Man, his vocals are positively soaring. Whatever style the band created, Coogan’s vocals always had a warm charm. As an eleven track album, it highlighted that The Mock Turtles were a versatile unit, prepared to take risks and not to stick to a formula yet this expanded edition with no fewer than thirty extra tracks takes the album to another level completely. I hadn't previously considered to be that influential but on tracks like Angel and Golden Children, it is evident that bands like Suede owe a debt to The Mock Turtles. There is a lot to like here, in this, an album's worth of demos. The expanded album allows us to revisit the earlier Mock Turtles EPs - Pomona, from 1987, And Then She Smiles, Wicker Man and post-album Magic Boomerang - are all present and correct. Of the dozen songs presented from those EPs, Magic Boomerang is possibly the most charming. Several cover versions from some of their influences are presented too. Being on Imaginary meant that they were regulars on the tribute albums that the label made its name for. Songs by The Kinks, Hendrix, The Byrds, Syd Barrett, Captain Beefheart and The Velvet Underground also feature here. The Velvet’s Pale Blue Eyes is the most captivating. Much like the Paris Angels take on What Goes On and the James reworking of Sunday Morning, Pale Blue Eyes is a fine tribute. Partly their own interpretation yet still staying true to the original. One of their earliest releases, the excellent Syd Barrett cover No Good Trying shows a slightly harder edge to the band. Some reissues have the odd B-side or out-take added and seem pretty pointless with nothing to please either the casual listener or the avid fan. Turtle Soup, on the other hand is extensive, thorough, comprehensive and a joy. Martin Coogan and Cherry Red have gone to great lengths to produce such a truly satisfying compilation. 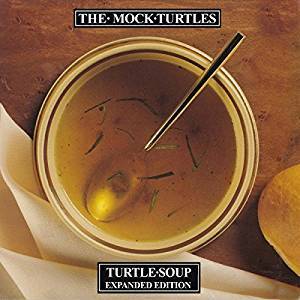 With so many reunions of lesser bands currently taking place, the expanded Turtle Soup demonstrates, as if it was ever in doubt, what a fine old English pop band The Mock Turtles were. The Mock Turtles were front man Martin Coogan (guitar & vocals), Martin Glyn Murray (guitar), Andrew Stewardson (bass), Joanne Gent (keyboards) and Steve Cowan (drums). The Mock Turtles are on Facebook and Twitter. Turtle Soup is released tomorrow, August 25.